A highly important and rare line bracelet by Tiffany & Co. Circa 1920, this incredible piece is set with 44 carre cut Burma sapphires – ALL GEM quality – weighing 21 carats. Exceptionally well matched, each sapphire has been pulled and re-polished by an expert old world bench jeweler in London. Put quite simply, these are the best of the best Burma sapphires – – Tiffany could simply not produce this piece today (new) as these sapphires are just not available (without, of course, finding matching stones in estate pieces and creating the bracelet – – a very difficult task). This is a true Art Deco period, original, Tiffany & Co., Burma sapphire line bracelet. 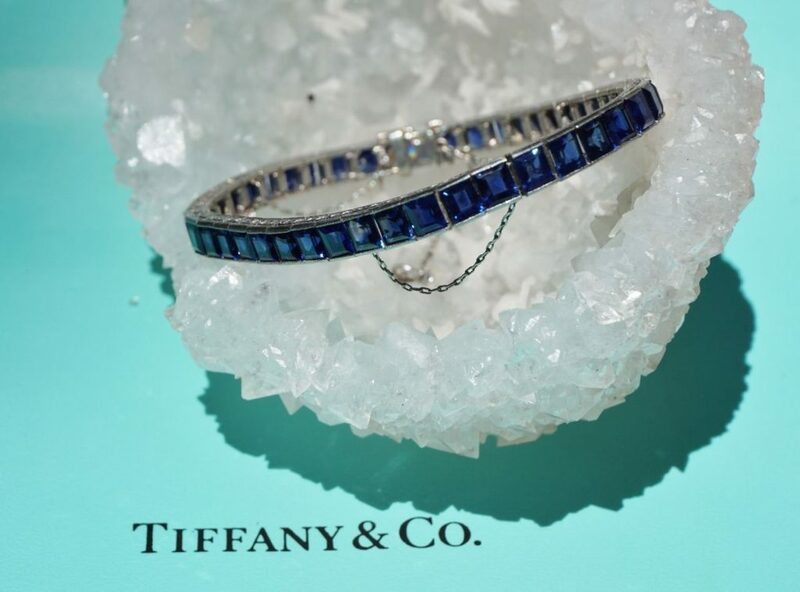 If Tiffany were to sell today, it would be AT MINIMUM $130,000, but likely MUCH more – – there is a definitive and justifiable premium for fine period Tiffany jewelry, with the finest materials and craftsmanship being just unmatched in modern jewelry. All sapphires have been individually pulled and polished and expertly re-set in bracelet.